We think about it every day, sometimes every hour: Money. Who has it. Who doesn't. How you get it. How you don't. 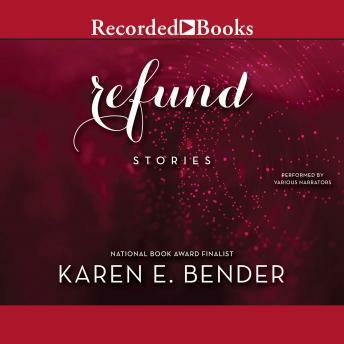 In Refund, Bender creates an award-winning collection of stories that deeply explore the ways in which money and the estimation of value affect the lives of her characters. The stories in Refund reflect our contemporary world-swindlers, reality show creators, desperate artists, siblings, parents - who try to answer the question: What is the real definition of worth? In "Theft," an eighty-year-old swindler, accustomed to tricking people for their money, boards a cruise ship to see if she can find something of true value-a human connection. In "Anything for Money," the creator of a reality show is thrown into the real world when his estranged granddaughter reenters his life in need of a new heart; and in the title story, young artist parents in downtown Manhattan escape the attack on 9/11 only to face a battle over their subletted apartment with a stranger who might have lost more than only her deposit. Set in contemporary America, these stories herald a work of singular literary merit by an important writer at the height of her power.